Regular readers will know that Salman Rushdie is one of my favourite authors. I’ve read many of his novels, including favourites Midnight’s Children and The Moor’s Last Sigh. Luka and the Fire of Life is a sequel to the delightful Haroun and the Sea of Stories (see my review here). They are both children’s adventure stories that are aimed at ‘tweens’ or YA – it was written for Rushdie’s 13-year old son – but are equally entertaining for those adults, myself included, who just love a good tale well told with lots of entertaining wordplay on almost every page. Luka is the younger brother of Haroun, and at twelve years of age is due an adventure. The beginning sees Luka and his story-telling father Rashid, the so-called Shah of Blah, walking home from Luka’s school. They pass a circus, run by the cruel Captain Aag. Luka laments the maltreatment of its many animals and wishes that Aag’s animals rise up in revolt against him. The wish turns out to be a curse which works and soon Bear the dog, and Dog the bear, appear on Luka’s doorstep and become his loyal companions. Aag retaliates by placing a curse on Rashid who falls into a deep state of unconsciousness. Nothing can wake him. One day Luka looks outside and thinks he sees his father in the alley. He rushes out to greet him but as he crosses the threshold he stumbles into the World of Magic. The man he saw was no man and no father, but a sort of ‘pre-ghost’, who calls himself Nobodaddy, who is slowly sucking hte life out of Rashid and who will ‘un-be’ when the real Rashid finally carks it. The only way Luka has of saving his father is to steal the Fire of Life. He sets out with Nobodaddy and his dog and bear friends, entering a kind of video-game world where he and his friends store lives to begin with and then lose them along the way as they try to get to the next level and the next, all the way to level 8 where they can steal the fire, then level 9 where they make their way home. While in this world, Luka has a three-digit number in the corner of his vision which indicates how many lives he has left. There are so many wonderfully inventive touches throughout. Rashid has given names to his two hands: No one and Nonsense. When he tickles Luka, he says he’s not tickling him at all, that in fact ‘No one’ is tickling him. When Luka protests he tickles him with the other and tells him it’s Nonsense. When Luka is on his adventure, they pass along the River of Time in which worms live that “made holes in the very fabric of Time itself” (ie, ‘wormholes’). And there’s a wonderful swirling maelstrom known as El Tiempo and the Loops of Time, which Rushdie playfully uses to repeat sentences and sections of prose over and over while the band of adventurers are stuck, freeing up new prose as soon as they exit. There’s also enough ancient god references – Greek, Roman, Persian, African, Asian, American – to satisfy a classical history professor! It’s wonderful stuff. Along the way, Luka learns good morals, like the need to run towards your problems rather than away from them. Ultimately, Luka and the Fire of Life is a story about the power of story. How else to rescue the life of a story-teller? If you enjoyed Haroun and the Sea of Stories, you’ll love Luka, (though there’s no need to have read the first to enjoy the latter). It’s great fun from cover to cover. Rushdie’s next book is to be his memoirs. For someone who has lived through the fatwa after publishing The Satanic Verses, during which he lived in protective custody for years, it should be a fascinating read. Before then, though, there’s a film version of Midnight’s Children to see, which Rushdie wrote the screenplay for. It has just premièred and I can’t wait to see it. On paper Siddon Rock had many of the elements that I like: magic realism, an Australian setting, a wide cast of odd characters, all in a debut novel and thus a new ‘voice’ to enjoy. It had also garnered a positive appraisal view from Lisa’s excellent review at ANZLitLovers. 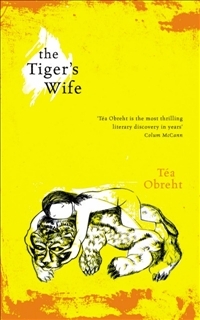 It had won the 2010 Commonwealth Writers’ Prize for Best First Book. 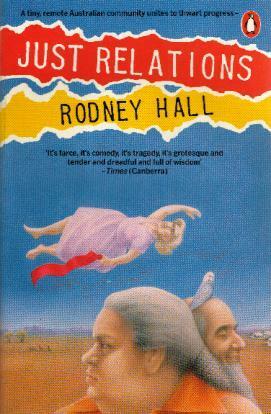 It is also short-listed for the 2010 NSW Premier’s Literary Awards in the ‘New Writing’ category. Would it match my expectations? 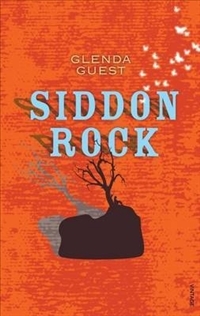 Siddon Rock is the story of the fictional town of the same name located somewhere in the Australian inland, its founding & naming, and the large cast of characters that inhabit it – many of whom are subject to miraculous visions, and each of whom carry secrets that bubble to the surface and infuse magical events. And it is a very interesting cast of characters, including an agoraphobic Methodist minister, a cross-dressing dressmaker who is Alistair by day, Allison by night, and the disturbed returned soldier Macha Connor, who grew up wanting to be a boy and, whilst serving as a nurse in the war in Europe, comes across her male namesake Mark Connor and takes his place on the front line after his death. There she witnesses the horrors of war and is never the same again, her arrival back into Siddon Rock marked by her naked, vigilant wanderings around the town with her .303. The second half of the book focuses on the arrival of Catalin and her son Jos, émigrés from Eastern Europe, looking for a home and an escape from their own war-torn past. The novel’s stronger and more interesting characters are all women (or wannabee women in the case of Alistair!). Nell, the maligned local aboriginal woman vies with Granna, caretaker of the Aberline family, for wisdom and mystery, and there is Sibyl the daughter of the local butcher who was abused by her father until he left and now runs the shop herself, always ambushed on Sundays by painful memories of her childhood. Indeed, men come off pretty poorly for the most part, including the befuddled Minister, the barman Kelpie Crush who hides a dark secret, the hapless Young George Aberline, and Fatman Aberline, cousin of Macha, who envies her abilities as they grow up. Whilst I love the magic realism of Rushdie, Garcia Marquez, or Peter Carey as an Australian example, some of the early fantastic events in Siddon Rock seem so over the top that I found some of images a little jarring for some reason. I also found the writing a little mixed. It is excellent in parts, but some sections seemed not as polished or well-edited as others. I found the constant use of names, particularly surnames, bordering on annoying. Kelpie Crush, barman at the pub run by Marge and Bluey, is pretty much always ‘Kelpie Crush’, hardly ever just ‘Kelpie’. But as a counterpoint there are lovely images such as Henry Aberline sitting on the rock that becomes known as ‘Sitdown Rock’, which is then corrupted to ‘Siddon Rock’. Henry, an Englishman who ventured to Australia in search of a butterfly, forsaking his cotton-mill wealth, eventually disappears, and the family of Jack, the aboriginal guide who lead him to this spot, say of his disappearance: “He’s a butterfly”, and, “He flew”. Henry leaves behind not just an interesting story, but a family tree and the fledgling town which becomes known as Siddon Rock. Once through the first 50-60 pages or so the writing is more polished. The ideas and images are well chosen and well depicted. Guest has found her stride, and the reading experience is a lot better for it. One of the central themes – that of the secrets the characters carry – really comes together. The idea and image of Catalin’s cello, on which her family history paints itself, is wonderful. There is also the hat that Alistair has designed and asked a Parisian milliner to make for him – it arrives looking nothing like the design he sent away, but the “rich maroon-red to black” and its wings remind us of the exact same colour of the butterfly that Henry had searched for when he also journeyed from Europe to Australia – a nice echo of the magical past in the magical present. There is Young George Aberline’s ill-fated plan to harvest the salt from the lake and sell it as Siddon Rock Salt – a humorous linkage of word and idea. Later, we have Catalin giving a talk on the history of Germany in the war to the school children through the use of shadows thrown onto the wall by her hands – it is a wonderful scene, poetic and emotionally charged. The story is quite ambitious for a first novel with quite a large cast of characters. The majority of the writing measures up to the ambition very well. It’s just occasionally let down. Take for instance (p114): “And so Majorie began the journey towards her music. We don’t need to follow the beginning story too closely.” (Emphasis added). ‘The beginning story’ sounds awkward. There are many examples like this. The great thing about the magic realism of Garcia Marquez or Salman Rushdie or even Peter Carey is that it feels necessary for the story; it adds meaning to the realism. Indeed, I often think that people neglect the second word of that description: magic realism – for the magical seems best when it serves realism rather than be on show for the sake of itself. For the majority, the magic in Siddon Rock serves the story and sense of place very well. There’s a lot to like about it and it is a wonderful debut novel. I think there are some fabulous ideas and some great writing, but it fell just shy of my (probably too high) expectations. That said, I’m very interested to see where Guest’s writing goes from here. Siddon Rock would be a perfect choice for a book-club, with lots to dissect and discuss, including, in my view, the poor ending! Of course, this is a very deliberate choice on the part of García Márquez – as is the equally particular six-part structure of the novel, in which the life and tyranny of an ‘eternal’ dictator is retold in each chapter. He said of this work that is was “a poem on the solitude of power”. (What’s with all the solitude Gabito?! It is, of course, one of his recurring motifs.) Just as many great war novels are delivered through the prism of absurdity to heighten the sense of madness, so one could argue that García Márquez has devised a perfect format for the paranoia and stifling of freedom inherent in a dictatorship with this tightly-packed, recurring nightmare of a narrative, where the simple act of drawing breath seems like sedition. There are the usual García Márquez signatures: the exotic, lyrical language, the surreal and distorted realities, the fusion of magical and real. The result is an uncompromising yet marvellous read, a book that truly pushes the boundaries of what the novel is capable of. The novel opens with the Generals’ ultimate death, then falls back to his ‘first’ death. The narrative is subject to these regular leaps in time, back and forth, the likes of which Faulkner would be proud. The main portion of the chapter deals with the ‘first’ death, which is really the death of his look-alike double. Such is the conceit of the real despot, lurking in the shadows, that he is surprised when the sunrise still occurs the next day. Apart from a couple of mourners, the city begins to celebrate his death. Aghast, the dictator shows himself to those people who have gathered to “divide up amongst themselves the booty of his death”, and orders them to be shot as they attempt to flee. The depiction of the deadly apparatus of power is a highlight. Take for instance the General’s rigging of the weekly lotteries so only he wins. He forces children to pick his winning numbers, and subsequently jails all two thousand of them. When the truth outs, he transfers them in “nocturnal boxcars to the least-inhabited regions of the country”, whilst he declares the rumours of the children’s’ imprisonment to be “an infamous lie on the part of traitors to get people stirred up, the doors of the nation were open so that the truth could be established …”. He invites the League of Nations to come and inspect the jails for confirmation. It all sounds eerily familiar. Whilst in exile, candy and toys are dropped to the children from planes to keep them happy while the General waits for a ‘magical solution’ to occur to him. The magical solution is the order to “put the children in a barge loaded with cement, take them singing to the limits of territorial waters, blow them up with a dynamite charge without giving them time to suffer…”. He rewards the officers who carry out the order with promotion and medals before having them killed for their crime. Soon thereafter the tyrant survives a failed assassination attempt. The suspect’s fate is a lesson in violent retribution. At the annual dinner at which members of the military are honoured, where Major General Rodrigo de Aguilar gives his familiar toast to the dictator, the guests become concerned when the Major General fails to show – but he then enters “on a silver tray stretched out … on a garnish of cauliflower and laurel leaves, … ready to be served at a banquet of comrades by the official carvers to the petrified horror of the guests … and when every plate held an equal portion of the minister of defense stuffed with pine nuts and aromatic herbs, [the General] gave the order to begin, eat hearty gentlemen.” It pays to stay on the General’s good side! In the fourth chapter, we find the General mourning the death of his mother. He tries to make her into a saint, organising for the Church to review her merits given all the miracles she has performed for the people, but the investigator sent by Rome finds out that these thousands of claims of miracles have been made by people paid for their false testimony. The effort to have her canonised fails. Not to be out-manoeuvred, the General proclaims the “civil sainthood” of his mother, declaring a national holiday in her honour, after which he declares war on the Holy See. The property of the Church is nationalised and all the priests and nuns are forced to leave the country stripped of everything, even their clothes. When she was alive the General’s mother wished he had learnt how to read and write. He is later taught to read by his lover Leticia Nazareno. He refuses to allow any interruption to his daily two-hour lessons even when rural people begin to suffer from ‘the black vomit’. As always, it is the people who suffer. In return for her lessons, Leticia convinces the General to have the Nuns and God allowed back into the country. Ironically, the Pope awards the General with a sash and a medal – the “order of the knights of the Holy Sepulcher”. Meanwhile, Leticia becomes pregnant with the General’s child, and forces him to marry her. The General by this stage is so convinced he is God that he names his son Emmanuel. As soon as he is born he is declared a Major General with full authority, and his mother takes him in his “baby carriage to preside over official acts as representative of his father”. (Of course, this is only one of thousands of babies he has sired – all ‘seven-month runts’). After one failed assignation attempt on both mother and son, they are eventually killed in a “hellish whirlpool” of rabid hunting dogs in a public market, organised by treacherous conspirators, which prompts a further round of revenge killings that even the General seems tired of, particularly when one of those killed turns out to be an aide he used to play dominos with. 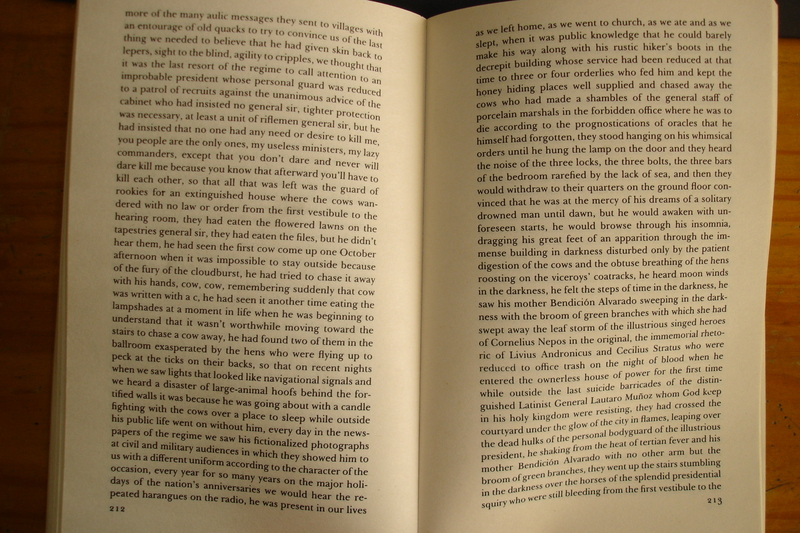 The final chapter sees the General promoted in the final moment before his death to ‘general of the universe’, “to give him a rank higher than death”. The chapter is partly narrated by a girl who is offered candy by the old General who then takes advantage of the twelve year old and has his way with her. He dreams of eating the girl, seasoned with rock salt, hot pepper and laurel leaves. The girl narrates this with fondness, even love, for the old man. When he dies, she thinks on behalf of the people “we no longer wanted it to be true, we had ended up not understanding what would become of us without him”. Thus begins a strong indictment of those who allow military dictators to enslave them. The General learns that the information given to him all these years has been falsified. One of the ironies of his newly acquired ability to read is the fact that the newspaper he reads is the only one of its kind, full of stories and pictures his hangers-on think he wants to read. The real news is something else entirely – for not only is the nationa morally bankrupt but economically bankrupt too. He and his cronies have driven the country into the ground, having sold off the farm as it were, forced to pay interest on borrowings taken to pay back other loans. The only thing left to sell is the sea. When faced with an ultimatum from the ‘gringos’ to allow the removal of the sea or face invasion by marines, the General relents. The sea is taken, in numbered sections no less, back to Arizona, whilst the people won’t come out to protest despite the offered inducements because they have done so before and been shot, and won’t fall for the same trick twice. Great polemic novels are a product of their time yet have the power and reach to become classics. This is definitely the case here. García Márquez began writing Autumn in 1968, and whilst he reportedly finished it in 1971, he continued to polish it until its eventual publication in 1975. So it sits in between One Hundred Years of Solitude (1967) and his novella Chronicle of a Death Foretold (1981), which was followed by Love in the Time of Cholera (1985). García Márquez was definitely at the height of his powers in these years. Autumn is set in an unnamed Caribbean nation, and the General is installed with the help of the British, but the man Garcia Marquez most had in mind when writing it was Venezuelan dictator Marcos Perez Jimenez. García Márquez said the overthrow of Jimenez “was the first time we had seen a dictator fall in Latin America.” The book was actually written in Barcelona in the autumn of the Franco’s brutal dictatorship, which also ended in 1975. Barcelona provided stern resistance to Franco and endured much hardship. Furthermore, Spain offered asylum to numerous ousted dictators including Jimenez. So there was plenty of material and first-hand experience for García Márquez to utilise in constructing the General’s character and his apparatus of fear. This extended to the persistent rumours of Franco’s death that dragged on much like the numerous lives of the General and very reminiscent of Fidel Castro. Speaking of Castro, much has been made of García Márquez’s friendship with him, whom he has been quoted as saying is a “very cultured man”. Cuban writer, Reinaldo Arenas recalls with justified bitterness in his memoir the 1980 speech given by Castro and attended by Garcia Marquez in which Castro painted the recently gunned-down refugees in the Peruvian embassy as ‘riffraff’. Apparently García Márquez applauded the speech. Perhaps in his mind a left-wing dictator like Castro is far superior than a right-wing version such as a Pinochet or Franco. In any case, it seems a perverse act for the author of Autumn. It is a shame that such a great writer became enamoured of the very type of man he ridiculed in his writing. Perhaps it is the ultimate proof of the cult-like power such men possess and the eternal danger they pose. Not everyone will enjoy Autumn, but it is, as they say, an important book**. I am a bit sceptical when I see comments like ‘deserves to be read twice’. I am not usually one for reading things a second time – unless they are truly special. This is one of those books. Whilst the novel is only 229 pages, it reads like a book at least twice as long. Close reading is a must, and you need to plan your reading time; you can’t grab a few sentences during the advertisements in your favourite TV show; reading in bed is problematic if you wish to sleep; and reading on public transport is downright treacherous – you’re trying to find a break in the story when your stop comes along that simply doesn’t exist. I dare say it will be a while before I return to it, my eyes will take a long time to recover(! ), but I’m convinced I’ll discover so much more in a second reading that it’s tempting to start again now. One last thing: spare a thought for the translator! Can you imagine trying to translate never-ending swathes of narrative such as this? Wow, I’m not sure if there are awards for translating, but if there is, Gregory Rabassa – also responsible for the English translation of One Hundred Years of Solitude – deserves it. * This was noted in García Márquez’s memoir Living to Tell the Tale which was intended to be the first of a three volume memoir, and covers his life up to the point he asked his wife Mercedes to marry him. Unfortunately, the other two will not be completed. 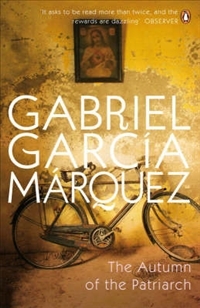 ** It is one of four of García Márquez’s works that sit on the (2008) 1,001 Must Read Books list, an honour he shares with: Austen, Calvino, deLillo, Dickens, Dostoyevsky, George Eliot, Henry Green, Hemmingway, Henry James, DH Lawrence, Iris Murdoch, Nabokov, Rousseau, Tolstoy, and Virginia Woolf, and possibly others I’ve missed. (Coetzee, Graham Greene, and Emile Zola have five!) It’s pretty good company to be in and no surprise from the Nobel Prize winner (1982). The Autumn of the Patriarch truly deserves its place on such a list. This delightful ‘fairy-tale’ is something for the young and the young at heart. However, like all good fairy-tales, and given this is Salman Rushdie, there is a very serious thesis at its core. Haroun’s father, Rashid, who goes by the name of the Ocean of Notions, or less admiringly: the Shah of Blah, is a master storyteller of Arabian Nights calibre. Rashid is “stuffed with cheery stories” until his wife – and Haroun’s mother – deserts them. In a flash, Rashid loses his story-telling powers and what comes next is a magical fantasy ride of strange creatures, figures, and places – a quest that Haroun and Rashid take to try to rescue the power of storytelling. Haroun and Rashid travel to the ‘second’ moon Kahani, where Haroun plans to find the means to return his father’s story-telling powers. However, the moon is in a turmoil of its own as Khattam-Shud, the master of silence and darkness has kidnapped the pompous Gup Prince’s bride-to-be. Worse still, the shadows of Khattam-Shud – evil overlord of the Chupwalas – are poisoning the ocean which is made up of all the streams of stories, and are also in the process of plugging the wellspring where new stories are born. Haroun and Rashid inevitably find themselves helping the good Gupees. This slim and multi-layered book – perfect to read as bedtime stories for youngsters, (or perfect under-the-covers reading for the rest of us! ), has a serious side, as all good fairytales do: stories vs silence – the battle to keep storytelling alive and vivid in the face of dumbed-down masses that live in the world of silence. “Freedom of Speech” is a gift to be utilised. Rushdie’s message is the power of fictional stories to frame and inform our understanding of life. 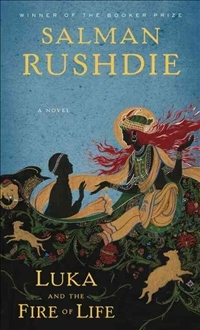 Like Rashid, Rushdie is a master storyteller – which gives rise to the very personal allegory involved here. This is Salman Rushdie’s first book after The Satanic Verses – which had resulted in the fatwa for his ‘heretical’ story. , Writing under the protection of MI5 and exiled from his son – to whom the book is dedicated, Rushdie in a way has had his own storytelling powers threatened and stolen – and he wants them back. Like Haroun and Rashid, he battles a shadowy enemy: religious zealotry. There are numerous examples of speech vs silence, light vs darkness, the material vs shadows. The Gupee half of the moon is constantly in sunlight, whilst the Chupwalas are in constant darkness. Furthermore, there is wall between their two worlds, named ‘Chattergy’s Wall’ after the Gup King. This sense of the building of walls between vastly different cultures also has a basis in real life, with the invisible wall between the West and the Middle-East. Magical things abound, such as the ‘plentimaw’ fish who travel in pairs and who talk in rhyming couplets; flying horse machines that talk and have removable brains that are the mythical creatures one uses to get to Kahani; water genies; floating gardeners; shadows who fight – and in some case separate – from their owners; the list goes on. They all help Haroun in his battle against the dark-lord’s shadow. All standard fairy-tale fare, but delivered with Rushdie’s playful and rampant imagination. He adds layers that beg to be interpreted. Names, for instance, are important. Haroun and Rashid for instance, are taken from the “legendary Caliph of Baghdad, Haroun al-Rashid, who features in many Arabian Nights tales. Their surname, Khalifa, actually means ‘Caliph’,” and there are many other examples. I am a big Rushdie admirer, particularly his earlier books such as The Moor’s Last Sigh and Midnight’s Children and the short stories in East, West. 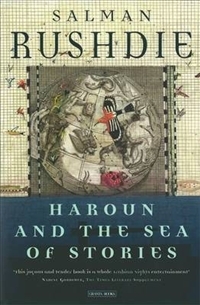 Haroun and the Sea of Stories, written in 1990, sits firmly within the best category of this early work. He has recently come back to something like top form, with the very good Enchantress of Venice after the less successful Fury and Shalimar the Clown (which I so wanted to love, but was a little let down by some aspects as well as the ending). He recently was quoted as saying he would soon write the story of his exile under the fatwa. I can only hope it is as adventurous and interesting as his finest work.